It is no surprise Brisbane artist Robert Brownhall wanted to be an architect. His oil paintings and pencil sketches are a stunning study of the built environment albeit with an imaginative twist. During an artist’s talk and drawing class held at Museum of Brisbane, where his Brisbane Airport artist-in-residence paintings are on display, Robert said he fell into art almost by default. “I always wanted to be an architect but I didn’t get the TE (tertiary entrance) score,” explained Robert rather forlornly to the class that ironically contained a number of architects. He was five points short of the university entry requirements to study architecture and it was the local art college which eventually claimed him. Robert’s work explores a love for urban landscapes and his art is steeped in realism that draws inspiration from artists such as American realist painter Edward Hopper. But his art work is not as it seems. The anonymous people, the magical sunset skies, the fluffy cumulonimbus clouds, the weather and even the shadows that characterise his paintings are all made up to construct a perceived realism. Sometimes buildings are completely painted out of the picture if he does not like them in his utopian landscape. Robert said when he was at art college he never achieved good marks despite his paintings having a picture perfect quality. After his art teacher, acclaimed Australian artist William Robinson, gave him some friendly advice about injecting imagination into his art, Robert’s marks began to improve and his skill as an artist has gone from strength to strength over the past 20 years. All of Robert’s paintings commence with an initial hand drawn sketch that he composes in situ, writing the various colours and other observational notes on his drawing. He rarely works from photographs and prefers to sketch on site. He then transfers his drawings onto canvas to paint. Robert said he can work on six paintings at any given time. “My paintings are about the way people live, the personality of the architecture (which defines a city) and the effects of light and weather. I especially like the morning and warm afternoon light in Brisbane and I am always trying to capture it in my paintings,” said Robert. Although Robert never achieved his ambition to become an architect, it is evident that Architecture’s loss is definitely Art’s gain and his paintings may well outlast many of the buildings he has painted. If architecture can inform art, how and when can art inform architecture? 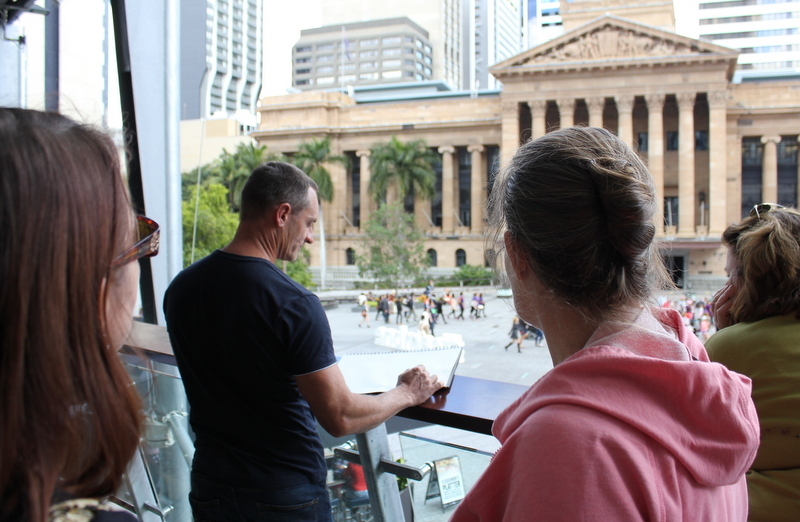 Robert Brownhall is Brisbane Airport’s first artist-in-residence. His exhibition of paintings from the residency is on display at Museum of Brisbane, level 3, Brisbane City Hall, until Sunday 28 August 2016. Cover image: Photo by Museum of Brisbane. Photo credit 2: Robert Brown Hall demonstrating how he views his landscapes.